With a full Hollywood background and settings but more an expose of scandal-and-gossip magazines of the era, has-been actor John Blakeford agrees to write his memoirs for magazine-publisher Jordan Winston. When Blakeford's daughter, Patricia, asks him to desist for the sake of his ex-wife, Carlotta Blakeford, he attempts to break his contract with Winston. 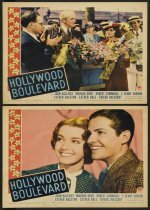 Hollywood BOULEVARD (1936) is one of the most unique movies ever made about the motion picture capital. In the form of a GRAND HOTEL, it brought together dozens of stars seldom found on the screen since the silent days; for many it was their only talkie experience. The plot was of the sordid life of actors and those who make a living from their misfortunes; some of its inspiration came from contemporary scandals. The film was primarily the creation of Robert Florey (1900-1979), a writer-director best known for his contributions to such movies as THE COCOANUTS, FRANKENSTEIN and MONSIEUR VERDOUX. Florey had a lifelong fascination and fondness for Hollywood, and even as Florey became an established American filmmaker in his own right by the end of the 1920s, he still retained an enormous sensitivity to the capriciousness with which the city had treated many others, as revealed in his 1927 avant-garde short, THE LIFE AND DEATH OF 9413--A Hollywood EXTRA. Florey made a practice of trying to obtain parts in his pictures for out-of-work actors, and he had an early appreciation of the cinema's heritage, writing a dozen books and hundreds of articles on the history of Hollywood. Hollywood BOULEVARD had its genesis in a "B" Florey directed for Paramount in late 1935, THE PREVIEW MURDER MYSTERY, in which he was able to use many nearly-forgotten stars of the silent days in cameo roles to authenticate the film's studio atmosphere. 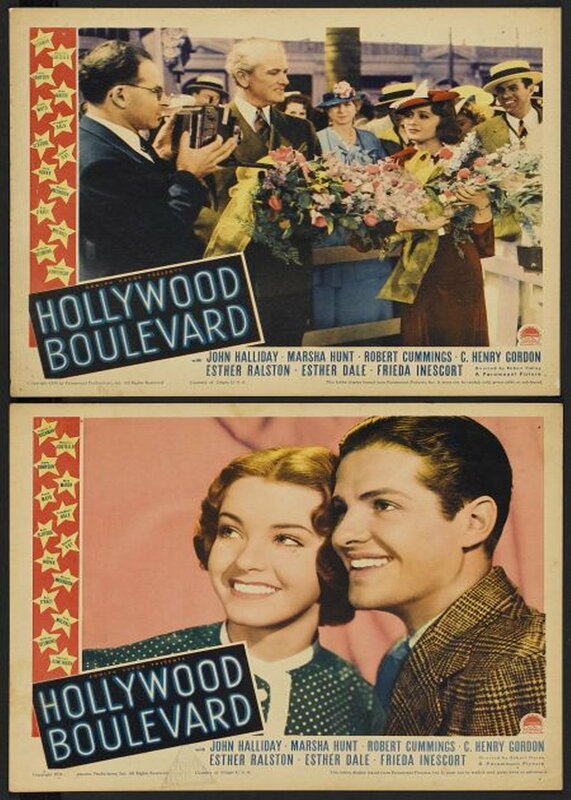 The warm reception accorded THE PREVIEW MURDER MYSTERY led producer A.M. Botsford to call on Florey to suggest another story on filmland, to be constructed around the title Hollywood BOULEVARD. After a few days Florey came up with a vague plot which was speedily approved. His idea was to fashion an entire movie around the appearance of a host of old favorites seen in supporting and cameo roles. Most of the performers approached warmed to the idea of stepping in front of the cameras one more time. Only a few one-time headliners, such as Theda Bara, refused to accept roles and salaries not commensurate with their former status. Eventually twenty-three former stars agreed to participate, more than could be found in any other picture of the time. Florey was assigned to collaborate on his script with a novice, Marguerite Roberts, who also took principle responsibility for the dialogue. Current Hollywood gossip and recent experiences provided plenty of inspiration for the scenario. However, Florey grew increasingly dissatisfied with the results of the hasty writing he and Roberts had done, and was willing for her to receive sole credit for their work, as he would be directing anyway. The basic plot is an elaboration on THE LIFE AND DEATH OF 9413. Once again the central figure is an unemployed actor looking for a job amidst the cruel splendors of movieland. However, in expanding the premise of THE LIFE AND DEATH OF 9413 to feature length, several sub-plots had to be introduced that steadily diminish the importance of the central characterization and deprive Hollywood BOULEVARD of the singleness of purpose that made THE LIFE AND DEATH OF 9413 so unforgettable. The severe editing only served to heighten the overemphasis on a disillusioned romance between the actor's daughter, Marsha Hunt, and an idealistic screenwriter, Robert Cummings, whose unctuous performance provides the only jarring note amidst a skillful and believable cast. Best among these was John Halliday, swaggering superbly in the difficult role of the forlorn actor finding that his days as a screen idol are over. Today the situations in which the people of Hollywood BOULEVARD find themselves seem to be extremely melodramatic -- although this was apparently not the reaction of audiences at the time the film was made. Weekly Variety said the movie had "one of the best scripts ever possessed by a behind-the-scenes-in-Hollywood picture;" Newsweek wrote that "The film capital turns a semi-candid camera on itself . . ." Stylistically, Hollywood is exemplified by an extraordinary credits sequence that lives up to the later description of the city as "crazy, senseless and exciting." Over a jazzy introductory score are a preponderance of diagonals, with frequent odd angles reflecting the disordered and askew nature of movie life. Florey's intention, he wrote, was for each new sequence to open "on an exterior of a then well-known Hollywood spot establishing the atmosphere . . . Before starting the film, I spent a week with a small crew shooting Hollywood inserts and locations." Principal photography took place in June 1936, with a final running time of 83 minutes. Instead the production's supervisor, Eddie Cline ordered the editor to remove all shots not absolutely essential to the plot line. Mae Marsh and Gary Cooper had their roles reduced, and Harold Lloyd's cameo was completely eliminated. Nevertheless, enough location scenes were preserved in the first three reels for the viewer to gather a taste of what the original Hollywood BOULEVARD could have been. That the picture had been planned and executed by Florey as a self-conscious historical document is clear from both the cast and settings. He managed to capture the flavor of Hollywood, from nightclubs to the main thoroughfare itself, including authentic footage of the studio back lot in operation and some stunning vistas of nearby resort areas like Santa Barbara and Malibu. Hollywood BOULEVARD, despite having no current box-office names in its cast, had far more care and attention lavished on it than an ordinary programmer. On the movie's release, it managed to appeal on the basis of the supporting cast and older stars, becoming popular among audiences and critics.